Within OpenShift Dedicated, Kubernetes manages containerized applications across a set of containers or hosts and provides mechanisms for deployment, maintenance, and application-scaling. The container runtime packages, instantiates, and runs containerized applications. A Kubernetes cluster consists of one or more masters and a set of nodes. You can optionally configure your masters for high availability (HA) to ensure that the cluster has no single point of failure. 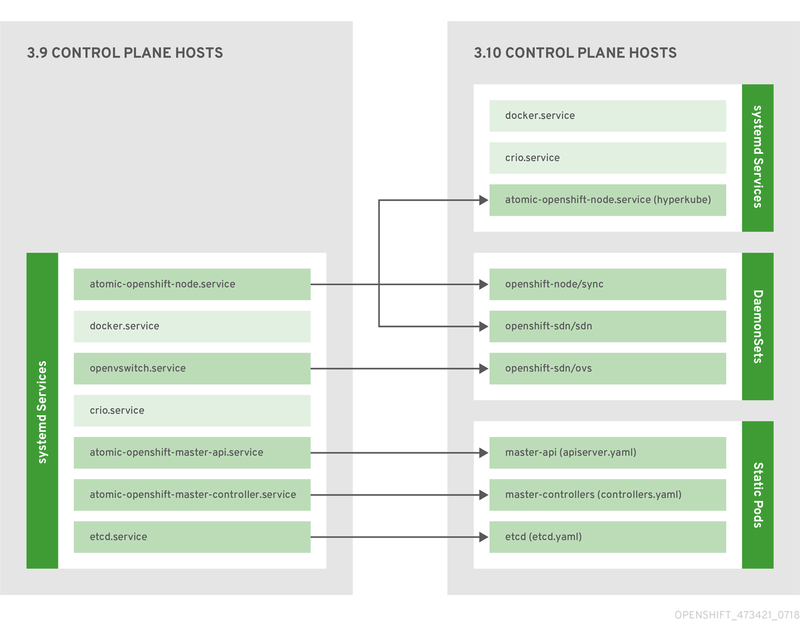 OpenShift Dedicated uses Kubernetes 1.10 and Docker 1.13. The master is the host or hosts that contain the control plane components, including the API server, controller manager server, and etcd. The master manages nodes in its Kubernetes cluster and schedules pods to run on those nodes. The Kubernetes API server validates and configures the data for pods, services, and replication controllers. It also assigns pods to nodes and synchronizes pod information with service configuration. etcd stores the persistent master state while other components watch etcd for changes to bring themselves into the desired state. etcd can be optionally configured for high availability, typically deployed with 2n+1 peer services. The controller manager server watches etcd for changes to replication controller objects and then uses the API to enforce the desired state. Several such processes create a cluster with one active leader at a time. Optional, used when configuring highly-available masters with the native method to balance load between API master endpoints. The core control plane components, the API server and the controller manager components, run as static pods operated by the kubelet. For masters that have etcd co-located on the same host, etcd is also moved to static pods. RPM-based etcd is still supported on etcd hosts that are not also masters. In addition, the node components openshift-sdn and openvswitch are now run using a DaemonSet instead of a systemd service. Fully redundant deployment with load balancing. One instance is elected as a cluster leader at a time. Balances load between API master endpoints. A node provides the runtime environments for containers. Each node in a Kubernetes cluster has the required services to be managed by the master. Nodes also have the required services to run pods, including the container runtime, a kubelet, and a service proxy. OpenShift Dedicated creates nodes from a cloud provider, physical systems, or virtual systems. Kubernetes interacts with node objects that are a representation of those nodes. The master uses the information from node objects to validate nodes with health checks. A node is ignored until it passes the health checks, and the master continues checking nodes until they are valid. The Kubernetes documentation has more information on node statuses and management. Each node has a kubelet that updates the node as specified by a container manifest, which is a YAML file that describes a pod. The kubelet uses a set of manifests to ensure that its containers are started and that they continue to run. A file path on the command line that is checked every 20 seconds. An HTTP endpoint passed on the command line that is checked every 20 seconds. The kubelet watching an etcd server, such as /registry/hosts/$(hostname -f), and acting on any changes. The kubelet listening for HTTP and responding to a simple API to submit a new manifest. Each node also runs a simple network proxy that reflects the services defined in the API on that node. This allows the node to do simple TCP and UDP stream forwarding across a set of back ends. apiVersion defines the API version to use. kind set to Node identifies this as a definition for a node object. 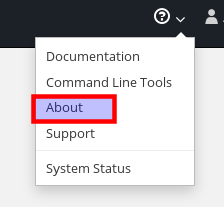 metadata.labels lists any labels that have been added to the node. metadata.name is a required value that defines the name of the node object. This value is shown in the NAME column when running the oc get nodes command. spec.externalID defines the fully-qualified domain name where the node can be reached. Defaults to the metadata.name value when empty. A node’s configuration is bootstrapped from the master, which means nodes pull their pre-defined configuration and client and server certificates from the master. This allows faster node start-up by reducing the differences between nodes, as well as centralizing more configuration and letting the cluster converge on the desired state. Certificate rotation and centralized certificate management are enabled by default. When node services are started, the node checks if the /etc/origin/node/node.kubeconfig file and other node configuration files exist before joining the cluster. If they do not, the node pulls the configuration from the master, then joins the cluster. ConfigMaps are used to store the node configuration in the cluster, which populates the configuration file on the node host at /etc/origin/node/node-config.yaml. 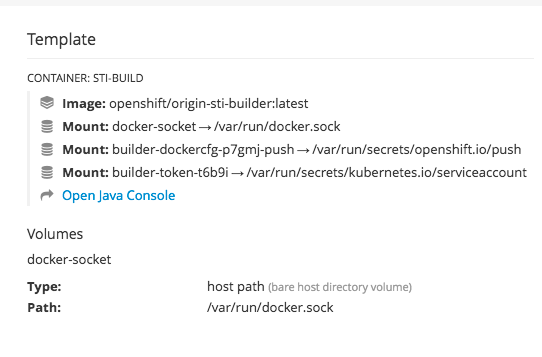 OpenShift Dedicated can utilize any server implementing the container image registry API as a source of images, including the Docker Hub, private registries run by third parties, and the integrated OpenShift Dedicated registry. OpenShift Dedicated provides an integrated container image registry called OpenShift Container Registry (OCR) that adds the ability to automatically provision new image repositories on demand. This provides users with a built-in location for their application builds to push the resulting images. Whenever a new image is pushed to OCR, the registry notifies OpenShift Dedicated about the new image, passing along all the information about it, such as the namespace, name, and image metadata. Different pieces of OpenShift Dedicated react to new images, creating new builds and deployments. OpenShift Dedicated can create containers using images from third party registries, but it is unlikely that these registries offer the same image notification support as the integrated OpenShift Dedicated registry. 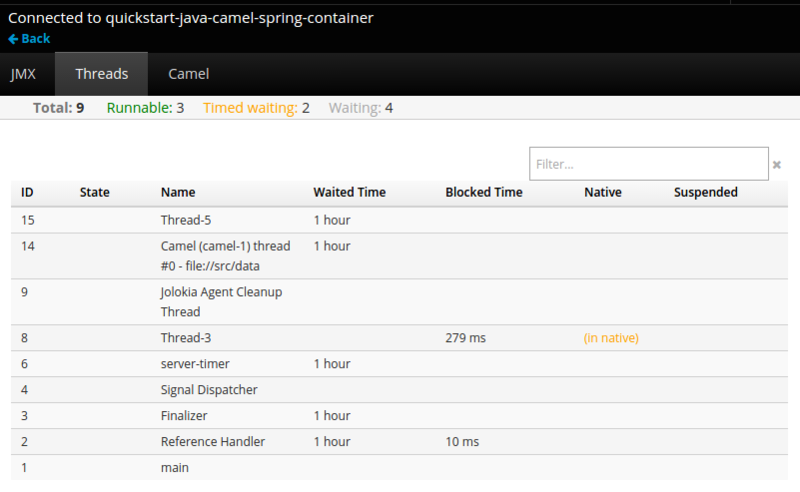 In this situation OpenShift Dedicated will fetch tags from the remote registry upon imagestream creation. Refreshing the fetched tags is as simple as running oc import-image <stream>. When new images are detected, the previously-described build and deployment reactions occur. OpenShift Dedicated can communicate with registries to access private image repositories using credentials supplied by the user. This allows OpenShift Dedicated to push and pull images to and from private repositories. The Authentication topic has more information. You can access your Red Hat Quay registry from OpenShift Dedicated like any remote container image registry. To learn how to set up credentials to access Red Hat Quay as a secured registry, refer to Allowing Pods to Reference Images from Other Secured Registries. All container images available through the Red Hat Container Catalog are hosted on an image registry, registry.access.redhat.com. With OpenShift Dedicated 3.11 Red Hat Container Catalog moved from registry.access.redhat.com to registry.redhat.io. The new registry, registry.redhat.io, requires authentication for access to images and hosted content on OpenShift Dedicated. Following the move to the new registry, the existing registry will be available for a period of time. OpenShift Dedicated pulls images from registry.redhat.io, so you must configure your cluster to use it. Web username and password. This is the standard set of credentials you use to log in to resources such as access.redhat.com. While it is possible to use this authentication method with OpenShift Dedicated, it is not supported for production deployments. Restrict this authentication method to stand-alone projects outside OpenShift Dedicated. 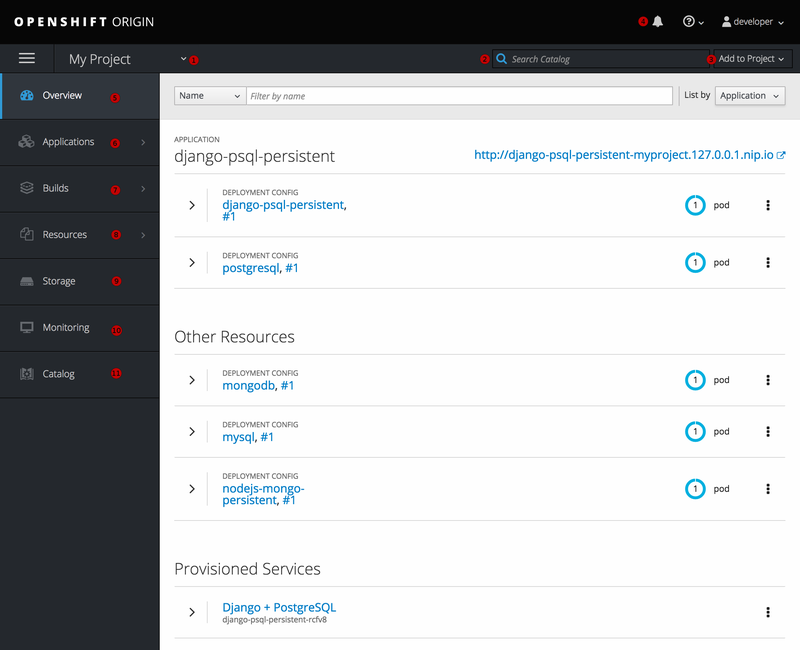 The OpenShift Dedicated web console is a user interface accessible from a web browser. Developers can use the web console to visualize, browse, and manage the contents of projects. From the About page in the web console, you can check the cluster’s version number. The project selector allows you to switch between projects you have access to. Create new applications using a source repository or service from the service catalog. Notifications related to your project. The Overview tab (currently selected) visualizes the contents of your project with a high-level view of each component. Applications tab: Browse and perform actions on your deployments, pods, services, and routes. Builds tab: Browse and perform actions on your builds and image streams. Resources tab: View your current quota consumption and other resources. Storage tab: View persistent volume claims and request storage for your applications. Monitoring tab: View logs for builds, pods, and deployments, as well as event notifications for all objects in your project. Catalog tab: Quickly get to the catalog from within a project.